Acrylic on Board • 30" x 40"
Karen will be exhibiting new work this summer. 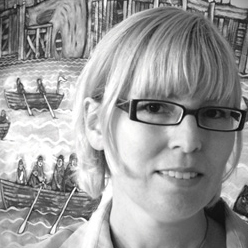 Visual artist Karen Gallant is a native of South Rustico, Prince Edward Island. Inspired by the elements and rhythm of the Island's landscape, people, nature, and local stories, her art inspires an instant feeling of having captured spirits caught between worlds; ours and theirs. Working in acrylics and mixed media, sometimes using found objects, Karen's work seeks the mysterious spark at the heart of Island stories that have been passed down by generations of natural observers and storytellers.